A large number of Official Big Bang Theory T-Shirts have been released recently and we want to show you a few more of them today. 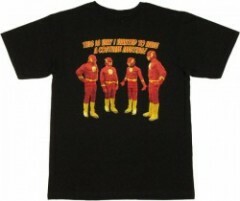 This black t-shirt features the guys all in Flash costumes with the text "This is why I wanted to have a costume meeting". The shirt is based on the Halloween incident in "The Middle-Earth Paradigm" where all the guys wanted to go dressed as the Flash. Now available at StylinOnline.com and also in female/junior size. This is the first official t-shirt to focus on Raj. 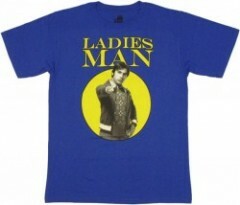 The shirt is blue and has Raj in a yellow circle with the text "Ladies Man" above. An entirely justified title we'd say. For a guy who can't speak to women, Raj rarely seems short of a mate. Buy now from StylinOnline.com. 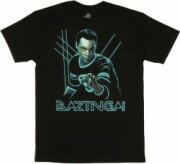 This black t-shirt features a glowing Sheldon in a spoof of the Tron Legacy posters. Everybody's favorite theoretical physicist is featured above his infamous catchphrase "Bazinga!" on the t-shirt. Available now at StylinOnline.com. We hope you enjoyed this recap of the latest Big Bang Theory shirts. You can view all of the official t-shirts in our clothing area, including a few new designs not shown here.